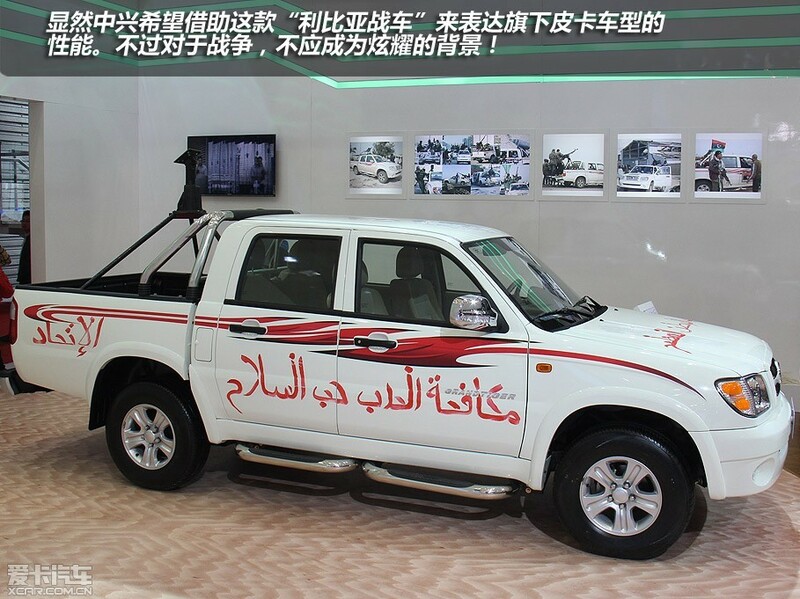 Chinese automaker Zhongxing showed images of the Libyan civil war on a giant screen behind its new Weihu pickup truck. 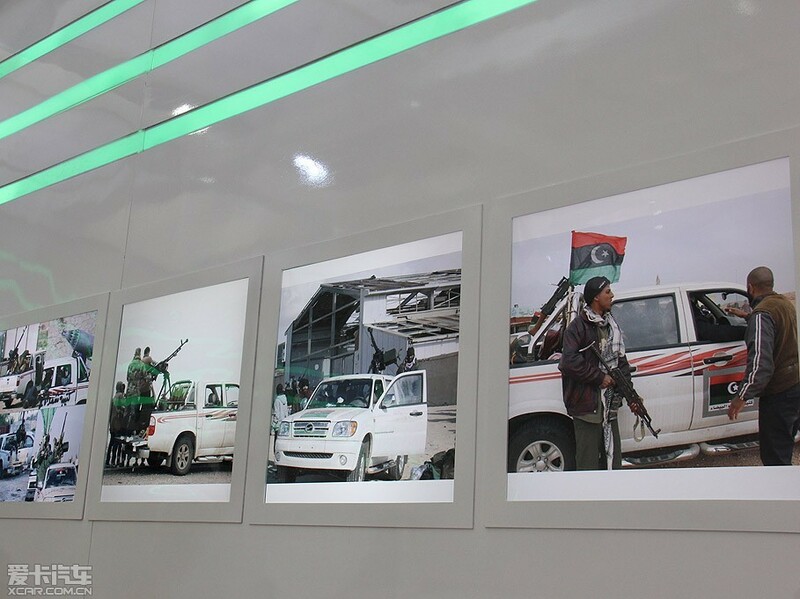 The connection: Zhongxing was world news in August last year when television showed Libyan rebels conquering the country in older Zhongxing pickup trucks. The footage was widely shown on Chinese TV, websites and printed media. Zhongxing took note and used the images to promote their ‘stronger than war’ vehicles. 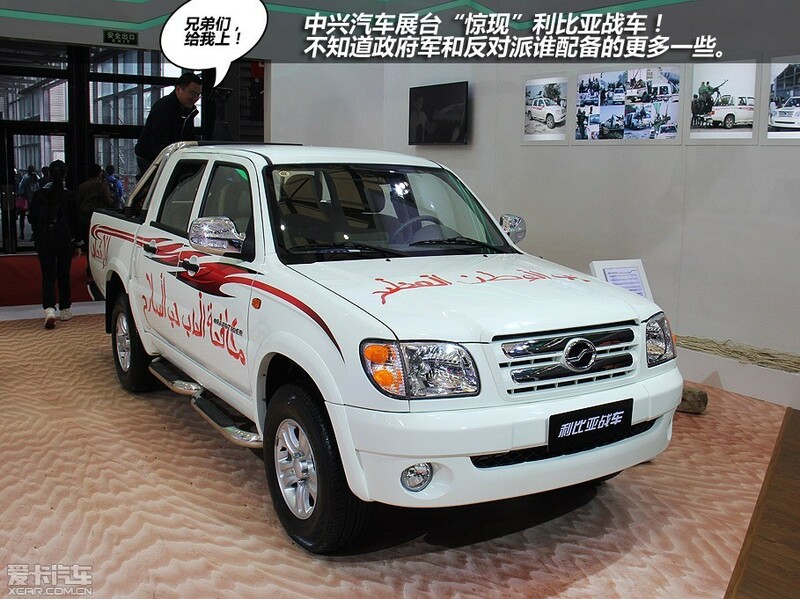 Are Chinese trucks replacing the mighty Hilux as the truck of choice for rebel groups? The Toyota Hilux has long had a monopoly on the market for rebel groups and terrorists, the mighty pick up truck can be modified to fit pretty much any sort of heavy gun, light gun or even basic missile systems, furthermore the Hilux’s legendary reliability and low cost has made it the king of trucks for rebels across the world from Afghanistan to paramilitary militias in South America. Hilux’s started appearing in rebel camps in the late 60′s when the first models appeared on the market and since then it has exploded (no pun intended) to become one of the best selling trucks for rebels, but its not only the rebels that like it. The Toyota War started in 1987 between Libya and Chad after Libya’s leader, Gadaffi, refused to recongise the new president of Chad, the war was largely undertaken by the Hilux from both sides, with the trucks being modified with heavy guns and also being able to carry armed men through the desert sands, urban environments or sweltering jungles. The problem with the current Hilux is that it has become a bloated electronic beast with far too many creature comforts for desert warfare, the US version of the Hilux, the Tacoma, has become a gigantic road swallowing beast. The Hilux became popular due to its ease of repair, wide parts network and ability to carry armed men through thick and thin whilst armed to the teeth, the Hilux’s popularity became self perpetuating. Now Chinese trucks from manufacturers such as Greatwall, Huanghai and ZX Auto are taking up the Hilux’s crown as the rebels choice of vehicle, these trucks are based on either old Toyota or Isuzu designs, they are cheap at sub $10,000USD, they can be repaired with just about any spare parts and most of all they are simplistic and are on par with the Hilux of yesteryear. In recent Middle Eastern revolutions and turmoil, it appears that Chinese motorbikes and trucks have been at the forefront of the action, Chinese truck manufacturers have been doing swift business in ‘rebuilding’ nations such as Afghanistan and Iraq especially as these countries are flush with ready to spend cash and little to no operating government to give out license tags. ZX Auto was in Iraq as early as 2000 and does regular business with Middle Eastern countries, Greatwall is in a similar position and relies heavily on the Middle East to fuel its export sales. The above picture shows several trucks heading off to war spearheaded by a Hilux and was probably part of the 5000 trucks that ZX Auto recently sent to Libya. Toyota partly owes its growth to those ‘technicals’ that we saw on the news from the 60′s and onwards, the Toyota name became a byword for high quality cheap vehicles, and it seems that the Chinese manufacturers might be heading down the same road as well. Zotye 2008 auto is a small and multi-function sport-utility vehicle, the appearance is moving and vogue, the space inside the car is spatial; the visual field is vast. All these make it convenient to operate, It is equipped with 1.3L and 1.5L engine, and the excellent design of transmission and suspension system, its sport performance is more outstanding and make your driving more comfortable. pls,tell me how to the spare parts for my private car which has been assembled in Egypt under the trade name “KOMODO”. As well as I wish to help you in producing such car in Egypt. Please visit this site, they are a professional sites about car parts. You can search their site for your spare parts or contact them for help. name “KOMODO” & “LANDMARK” in china.